I found this video on conservation in Belize from the NYT. Anyone interested in preserving the ocean environment should give this a look. Belize has set aside a no fishing zone near Ambergris Cay which is helping to keep the whole fishery in good shape. The video talks about shark finning, which is disgusting. Unfortunately, countries like China and Japan have a hankering for shark fin soup and held up an international quota for sharks. Just unbelievable. Be sure to give this video a watch. I tried to imbed the video but the Times won't let you do that. BUT, it is worth a click. I've put together my checklist that I'll be using for my upcoming trip. I thought I would share it as it's always fun to see what others are using. I've listed brands beside the items because I'm always curious what others are using. 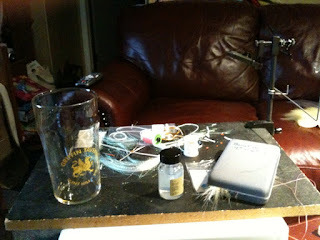 A busy weekend but I had a chance Sunday to practice some fly casting and to tie some flies. When I practice I try to do so against the measuring tape. I hit 92 feet and shot all the line out. If i had the entire line stripped, I think I would have hit 100. It was just one of those casts where you put it all together. On the bench, I've been tying Gotchas and a Gotcha with a sili leg tied off the nose. I'm really pleased with how they've turned out. I've got some videos on the fly tying page. I'm looking to put a sili legs on my 8 wt and a gotcha clouser on my 9 wt and this is what I'll fish with. I also wanted to say that I added a few new links to the site. 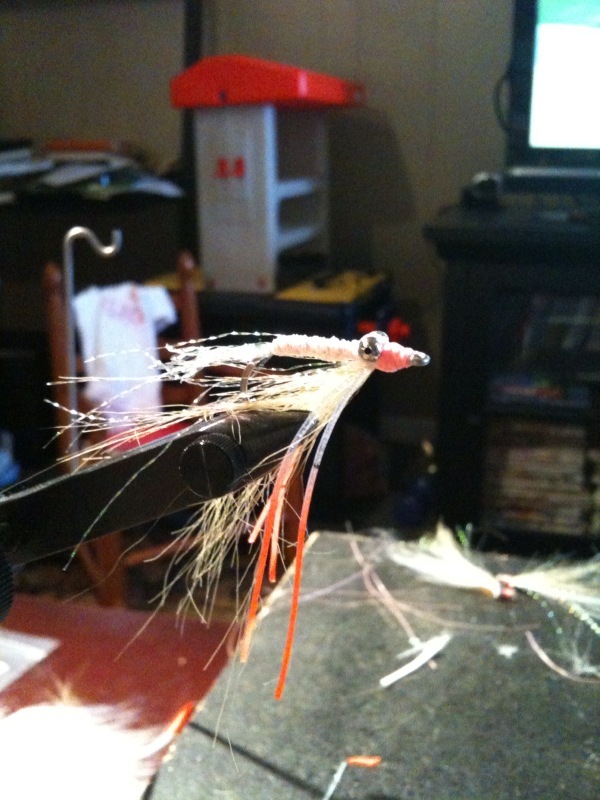 Be sure to check out bonefishonthebrain blog and check out the Black Fly Club's blog. The Black Fly Club has a great trip report that you should check out. It's written by Vaughn Cochran who is a very talented artist and great fly fisherman. Be sure to check it out. I am so ready to go bonefishing. Only a couple weeks left and I'm busy tying more flies and trying to get my equipment ready. I'm working on my own bonefishing equipment check list that I'll share with everyone. I know there are a ton, but I have a few tips that may be new. This 1,800 acre park located on the south central coast of New Providence is an important marine nursery area. It provides protection from storm surges to the communities on the southern coast of New Providence. In addition to the wide array of juvenile fish, crawfish, and conch, this wetland serves as a haven for waterfowl and a variety of Bahamian Flora. Here's a link to all of the National Parks in the Bahamas. I had a chance to fish the Lucayan National Park last year and the fishing is tough, but the park was beautiful. The guys at WORLDAngling have a new site to raise awareness on Permit fishing in the Keys and to try and get this fish listed and protected as a gamefish. Permit are the Holy Grail of flats fishing and become an obsession for many who catch them or are looking to catch one. If you can make te date, be sure to sign up an show your support. I've talked about a music section on The Bonefish Flat before, and I'm getting there, but I thought I would share a mix I put together for the upcoming trip. Here's a great article from The Tribune which I'm assuming is the prominent newspaper of the Bahamas and it's based in Nassau. The story provides some promising news and hope for a country to realize an invaluable resource. It seems that Bahamians understand the value of recreational fishing to the country. I found it interesting that the two islands benefitting the most from bonefishing are Andros and Abaco. I would have guessed Andros, but not sure that I would have thought Abaco number two. At any rate, it's great that the country is understanding the value of their AMAZING fishery. Another interesting exercise is to take a few minutes to read through the paper. Something about it just feels like life is a bit simpler. As my loyal readers know, I post a lot of articles from the NY Times and the Washington Post. Both newspapers deliver a lot of news, but there is something refreshing about reading through this paper. THE Bahamas' flats fishing industry has an economic impact of nearly $141 million annually, according to a recent study by the Bahamian Flats Fishing Alliance. The study found that although fishing-related tourism was down by 11.6 per cent from 2007 due to the global recession, the flats fishing industry - including bonefish, tarpon and permit - continues to provide considerable economic value. The results of this study, entitled "The Economic Impact of Flats Fishing in The Bahamas", show that with responsible conservation and management, this fishing industry can continue to be an economic engine for the Bahamas, especially the Family Islands. According to the study, expenditures by anglers were not just for guides and accommodations, but also for meals, transportation and other goods and services that benefitted the economy. Anglers spent approximately 27 per cent more than general visitors per visit, and 17 per cent more per visitor night, further emphasising the importance of recreational flats anglers to the country's economy, the study said. The islands with the greatest economic benefit from flats fishing were Andros and Abaco, but all islands benefitted from flats anglers and direct expenditures on the Family Islands ranged from $3 million to more than $18 million. This study said that this fishery and its associated economy can be maintained through good conservation of coastal habitats, water quality, and protection of the fish populations. The Bahamas Flats Alliance is a partnership of the Bahamas National Trust, the Bonefish and Tarpon Trust, and the Fisheries Conservation Foundation. The Alliance said it commissioned the study as an important first step in demonstrating to local communities and resource management agencies the need to protect these vital resources. I'm less than a month away from my big bonefishing trip. 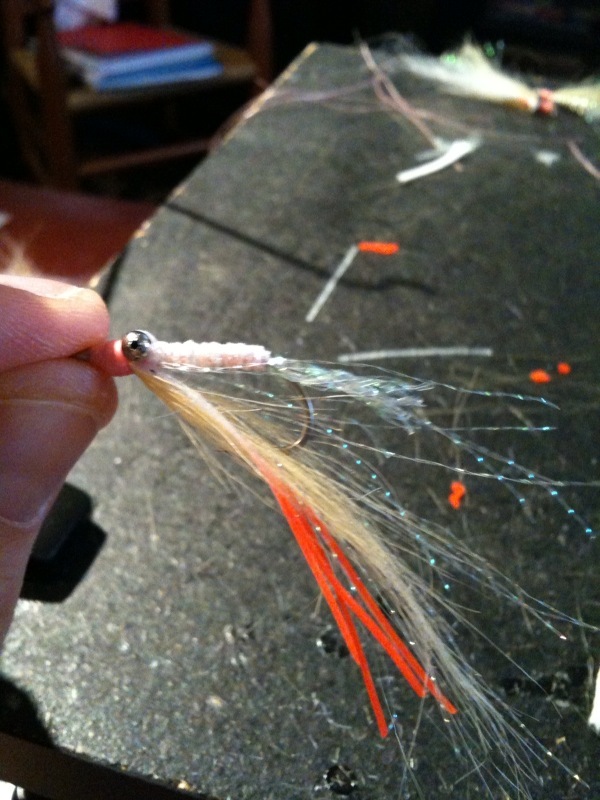 I'm getting ready to get into the mode of casting practice and tying flies. You've seen a few of the flies on the site and if not, you can check them out on our fly tying page here. I'm really looking forward to a few days of R&R and using what I've learned in previous trips to be a better angler on this trip. This is the last day in Philly so I had to put up Pats against Geno's. 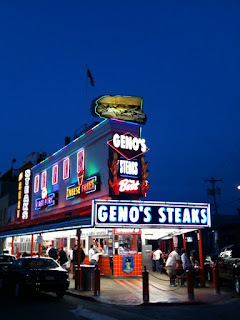 I went to Geno's tonight and here's a pic. Sorry Geno's, but Pats is the winner. In bonefishing news, Bonefish and Tarpon Trust is conducting a bonefish census in Florida ranging from Key Biscayne to the Marquesas. Below is the press release. Esteemed Guides and Anglers, we need your help! This will be our third consecutive year of conducting a Spring Bonefish Population Census to calibrate with results from the Fall Florida Keys Bonefish Population Census, now in its 8th year. The 2010 Spring census event is planned for *Wednesday, April 21, 2010*. Bonefishing is a multimillion dollar industry in the Florida Keys and virtually all of the fish are released unharmed to fight again. The bonefish census, coordinated by the Bonefish & Tarpon Trust (BTT) and the University of Miami RSMAS, helps to determine population trends of one of the Keys most important sport fish. This is the first and only population estimate ever done on bonefish anywhere in the world. The census information is vital to evaluating year-to-year changes in the bonefish population and providing guidance that ensures a sustainable fishery!!! Fall census results have indicated a population of just over 320,000 bonefish in the Florida Keys fishery. We want to use the Spring census to calibrate our Fall estimates and to determine if there is a seasonal component to the bonefish population size estimates. Of particular note, your participation in this year’s census is critically important because we are trying to get a handle on the extent to which January’s extremely cold weather has impacted the Florida Keys bonefish population. We are counting on you to help us determine the current population size of this very important sports fish. What a jam packed weekend. I had a chance to go fishing for a little while on Saturday for Shad in the Potomac. For those that don't know, there are two types of Shad that we target, Hickory and American with the latter being a bigger fish. Shad are anadromous which means they live in saltwater but breed in fresh. They are a hard fighting fish and make a great target with a fly rod. Unfortunately, I wasn't too lucky but some of the bait casters were catching fish. My problem was that I was fishing from the bank and limited to a roll cast. I could get out about 40 feet, but the fish seemed to be biting at 50. Next weekend I look to get the kayak out and to have more on this fish. More good news about shad is that Rockfish (striped bass for those not in the mid-Atlantic) follow the shad. On Sunday I ran the Cherry Blossom Ten Mile race in the morning and headed to Philadelphia in the evening for work. That makes a long day, but I capped off finishing the race with a cheesesteak. 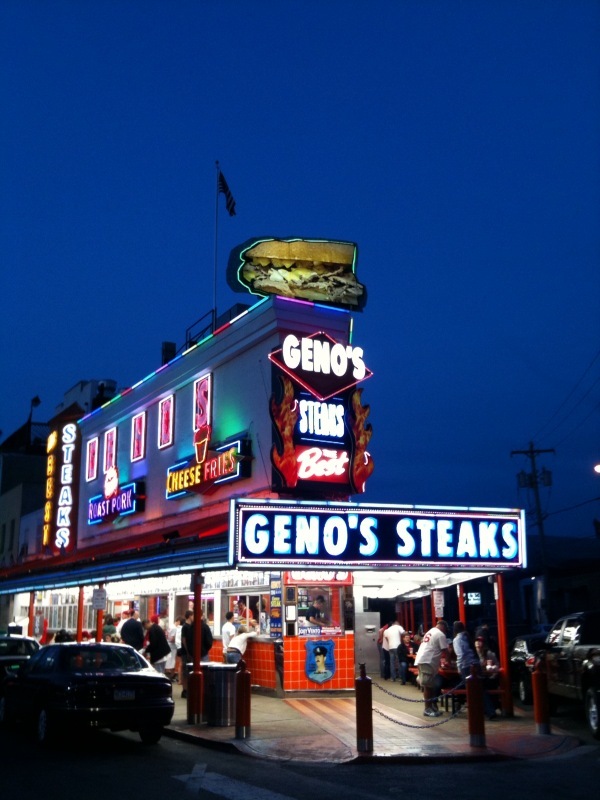 Pats or Geno's? We hit Pats. I got a heads up yesterday from Costa Del Mar about a new style of shades called the Cheeca. Shades are a requirement for flats fishing and Costa makes arguably the best shades on the market. I am a big fan of Costa and I wouldn't be caught on the flats without mine. Costa is the real deal when it comes to corporate responsibility, too. If you notice in the release below, Costa donates money back to Project Permit which is performing invaluable research on the Holy Grail of the flats. Be sure to check out the release below on the new Cheeca's. Daytona Beach, Fla. – Apr. 8, 2010 – Sophisticated performance meets aggressive sport style with Costa’s new Cheeca sunglasses. Available in retail outlets and Costa’s online store now, Cheeca features a large, classic wrap fit with a stylish mid temple mounting. Named for Cheeca Lodge, one of the best places in the Florida Keys to fish for bonefish, tarpon and permit, Cheeca comes in tortoise and black frame colors, as well as new color combinations white/tortoise and black/coral. The nylon frames feature Costa’s new revolutionary anti-rocking hinge, the most advanced spring hinge available today. In addition to providing an even more comfortable fit, the anti-rocking hinge significantly increases durability and virtually eliminates movement between the frame front and temple. The sunglasses are available in the Costa clear 580™ lens technology. 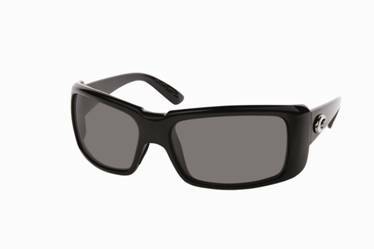 Costa’s 580 lenses block yellow light, and are superior in cutting glare, enhancing vision and protecting against harmful UV rays, so outdoors and angling enthusiasts can see more clearly. Each pair of Costa sunglasses are hand built in Costa’s home base in Florida, and come with a lifetime warranty against manufacturer’s defects. As part of Costa’s ongoing commitment to protecting the Earth’s fisheries, a portion of proceeds from sunglass sales this year will benefit the Bonefish Tarpon Trust’s Project Permit, an initiative to tag 6,000 permit this year in Florida and the Caribbean for research and scientific study. Cheeca retails from $149 to $249 depending on lens selection, and is also available in an Rx option through one of Costa’s authorized optical labs. Visit Costa online for a retail outlet locator and the company’s online store. On a lot of blogs, you'll see write-ups from guides about what to expect from them. But what about what we expect? Remember, I'm writing from a perspective of someone who gets a couple trips each year here, so here is what I think. The number one thing I expect is to put me on fish. They can't cast for me or make the fish eat my fly. But if they can show me fish, I know the rest is up to me. Fish won't eat a fly? That's just fishing for you. Fish spooks on a cast? That's just fishing. I also expect guides to be courteous. If they get ticked at me for missing a shot, that's fine. I'm probably upset too. Just don't be irate like the stories you hear from the old crusty Florida guides of yesteryear. Granted, I think a lot of these guides are gone. Here's a picture of me, my dad, and a great guide, Bully. I say this because when I'm fishing with a guide, I'm on vacation. Guides must go on vacation, too, and they wouldn't want to be yelled at on vacation, would they? All of this being said, I've had great luck with every fly fishing guide I've fished with. There has been only one guy who was kind of a jerk. He didn't really get upset so much as he was just lazy and couldn't find fish. He didn't seem to look very hard, either. I'm running behind today, folks, but I do have a few things in the works. Knock on wood I'll have a tying video up tomorrow. It's been shot, I just have to edit it. I'm also working on adding a music section to the site with some of my favorite bands. Why? Becasue I love music and becasue on forums that I frequent, people seem to talk about music a fair amount. Speaking of music, I had a chance to see my favorite band Wilco on Tuesday night (big part of the reason I'm running behind). Wilco has evolved from an Alt-Country band from their debut album A.M. into a more standard rock band with an avant garde flavor. The latest album, Wilco The Album, is really a combination of all of their sounds. If you're looking to have a listen, check out Yankee Hotel Foxtrot which was nominated for a Grammy. The band is based INS Chicago and the lead guitarist, Nels Cline, is consistently rated as one of the best guitar players in the world. Nels put on an amazing performance on Tuesday night and the show was just incredible. They played a three hour set which in the middle they brought in a small trap set, went acoustic more or less, nd turned down the lights to play some of their more quiet songs. Here's a pretty bad pic from the show here. I definitely urge you to check out Wilco. Chances are they are playing in my truck on the way to the water.